Anne passed away peacefully on January 24,2019 at Creekway Village, Burlington in her 90th year. Wife of the late Cecil Edward Finnamore (2015) for 74 yrs. Loving Mother of six children, David (Susan) of Ancaster, Anne (Joseph) Krawczyk of Hamilton, Larry (Glenys) of Perth, Australia, Karen (Neal) Jones of Burlington, Joseph (Heather) of Burlington and the late John Allan Finnamore of Campbellville (1983). Sister of James Mathieson of "The Wellington Retirement Home", Hamilton. Predeceased by her parents David Mathieson (1980), Grace Mathieson (1984), sisters Mary Robinson (2002), and Joyce Gladysz (1990). Born in 1928, Anne emigrated with her parents from Cowie Stirlingshire, Scotland at three years old to Hamilton. She traveled on the maiden voyage of "The Duchess of Richmond". 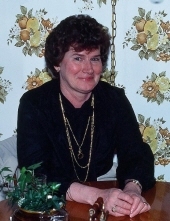 Her hobbies included stained glass, painting, Classical and Jazz music. She was a Girl Guide Leader at St. Luke’s Church, Burlington, and a CGIT (Canadian Girls in Training) Leader in Foxboro. Anne and Cecil traveled the World fifteen times to Australia! She will be missed by her many nieces and nephews, ten grandchildren and ten great-grandchildren. A special thanks to the Nurses and Staff at Creekway Village in Burlington for their excellent care! A private Family Service was held at Kitching, Steepe & Ludwig Funeral Home in Waterdown. Those who wish, donations can be made to the Alzheimer’s Society of Hamilton and Halton. "Email Address" would like to share the life celebration of Anne Millar Addie Finnamore (nee Mathieson). Click on the "link" to go to share a favorite memory or leave a condolence message for the family.